Contact me about coming to your community to speak. "It was a challenge for me to experience the moments of silence ... a first step to contemplative prayer, a new thing for me, the concept to listen and not just 'talk' to God in prayer, but to listen. I got better at it as you led us through." "[This Lenten program] has been something I look forward to, partly because it's surprising and unexpected.... I have been particularly surprised at how you have melded our secular and church lives and interests." "Spiritual and mystical in the finest sense of both words." "I thought writing haiku in response to scripture would restrict my expression. But my haiku kept changing, almost as if it had a life of its own. Boy, is haiku neat." "Thank you from the bottom of my heart for being willing to spend the weekend with us and for sharing your journey with us. I will be waiting for your next book." 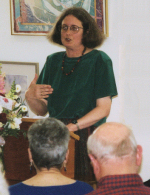 "A Strip of Black Vinyl" -- a video excerpt of Margaret speaking at the Quimper Unitarian Fellowship in Port Townsend, Washington. To contact me, discuss topic ideas, or ask about bringing me to your community to speak, email margaret (.at.) inthecourtyard (.dot.) com or call 360.385.3489. Speaker at events; workshop, seminar, retreat leader. See below for topic ideas. Online class developer and teacher. Guest author to a book group, by phone or in person. Book reading and book signing. Guest preacher. I am a licensed Preacher and Worship Leader in the Episcopal Diocese of Olympia. I have served as guest preacher at Episcopal, Presbyterian, and Unitarian churches, as well as preaching regularly at my home parish of St. Paul's, Port Townsend. "Together On the Path - Crossing Over Into Community," Women's retreat at Grace Lutheran Church, Port Townsend, Washington. "Roots and Blooms," Haiku Reading with the Port Townsend Haiku Group, Seabeck Haiku Getaway. "Autumn Light - Writing Haiku from Nature's Text," Stillpoint at Beckside, Bellingham, Washington. "Friends in Linked Verse," online class offered through In the Courtyard. "Looking for New Life - Starting a Nature Journal." Online class offered through In the Courtyard. "Sky Above, Earth Below - Writing Haiku as a Mindful Practice." Online class offered through Pilgrimage Port Townsend. "Making and Walking the Spiral Labyrinth," retreat at Shalom Prayer Center, Queen of Angels Monastery, Mt. Angel, Oregon. "Stumbling Toward God," retreat at the The Priory Spirituality Center, Lacey, Washington. "Tell the Truth: Finding the Universal Story in Your Story"
"The Breath of Life: Writing with Spirit."